Trek's top of the range Émonda SLR range is ready to take you up the steepest of ascents whilst providing you with the tools you need to tackle the descents. 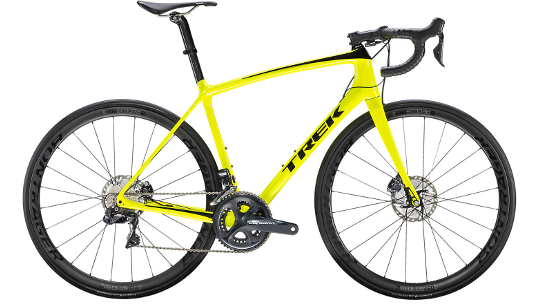 The ultralight frame (665g with Vapour Coat paint) is Trek's lightest ever disc road frame. Whilst incredibly lightweight it is also super responsive and stiff thanks to Trek's H2 geometry and fitting position. 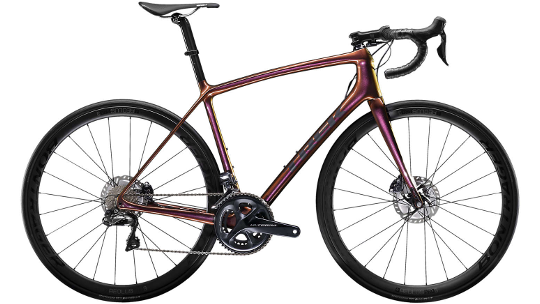 The Émonda is a great option for those looking for a road racing option or a bike to tackle continental mountain ranges or even hilly routes a little closer to home. Flat mount hydraulic disc brakes provide blissful braking on all surfaces and in all conditions, that won't threaten to falter when the rain comes down or road muck gets thrown up at you. Finally, the SLR 7 edition of the Emonda range features the improved Bontrager Aeolus Pro 3 disc and tubeless ready wheelset as well as Shimano's Ultegra Di2 8070 11-speed groupset that revolutionises shifting with electronic technology.